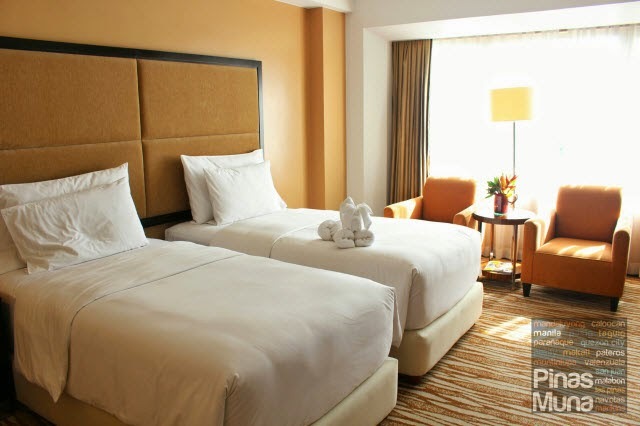 Acacia Hotel Manila is a 261-room luxury hotel located in southern Metro Manila. 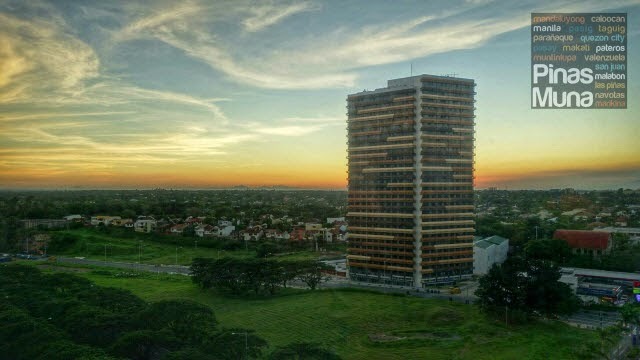 It is strategically located at the center of the fast-growing commercial and business district of Filinvest Alabang, near corporate offices, restaurants and shopping malls. 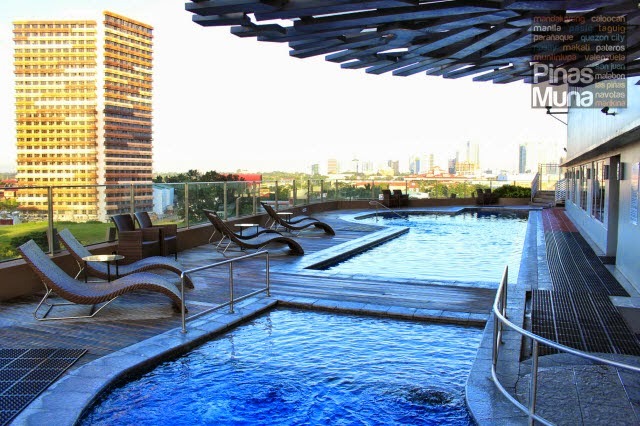 It is easily accessible from Ninoy Aquino International Airport via the Metro Manila Skyway. 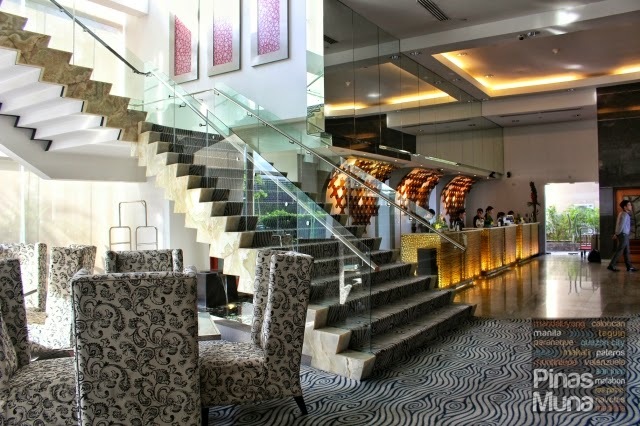 Acacia Hotel Manila takes pride in being the only hotel in southern Metro Manila with a Grand Lobby. 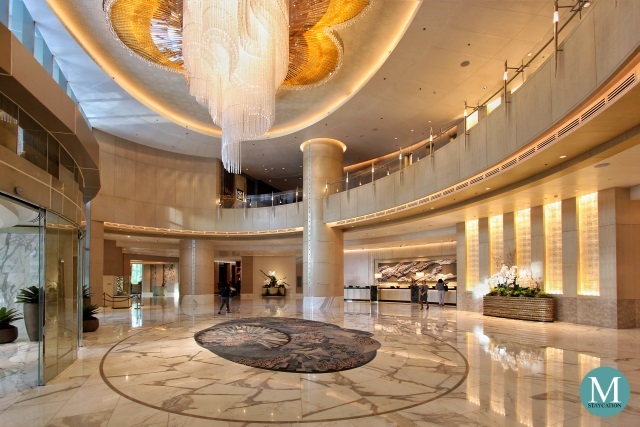 The spacious lobby is elegantly designed with touches if Filipino flare. The use of high glass wall is an eco-friendly design that allows more natural light into the space, thus reducing the use of electricity, and ultimately reducing its carbon-footprint. 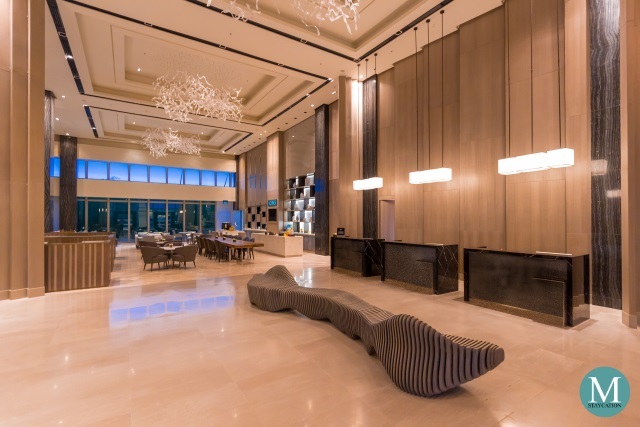 The Grand Lobby also houses The Lobby at Acacia, one of the hotel's F&B outlets that caters to casual and business meetings. The restaurant serves breakfast meals, main entrees, light snacks, desserts, coffee as well as non-alcoholic and and alcoholic beverages. 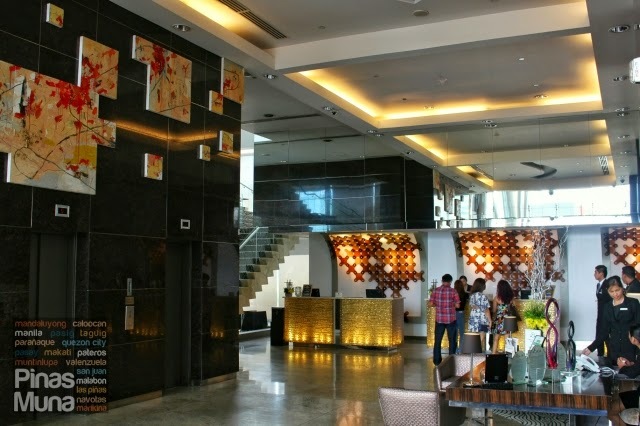 For checked-in guests, The Lobby is the perfect place to meet and entertain visitors. 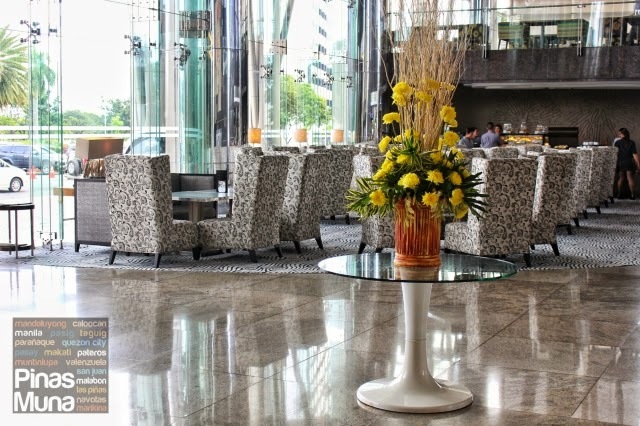 Nearby offices can also have their business meetings over breakfast or lunch at the comfort of the The Lobby's stylish high back chairs and well air-conditioned space. 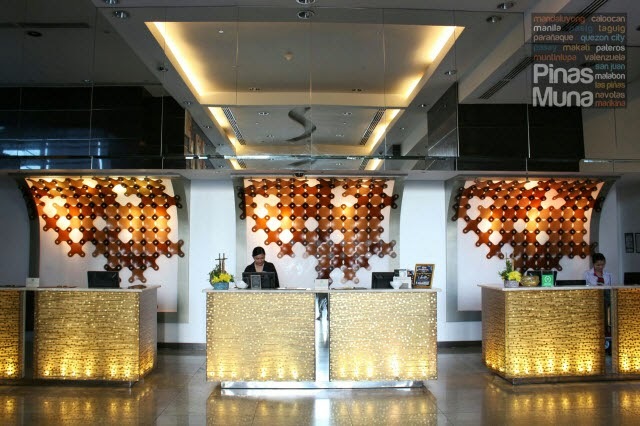 Acacia Hotel Manila is a Filipino-owned and Filipino-operated five star hotel and boasts of their top notch customer service with a distinctive touch of Filipino hospitality. 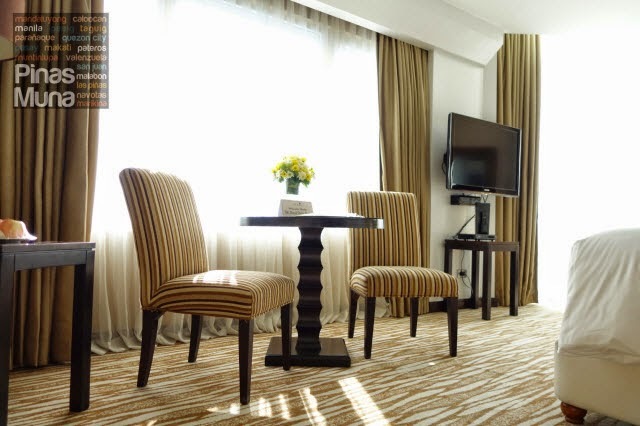 Filipino like no other, the Acacia hospitality is what makes every stay at Acacia Hotel Manila a memorable one. 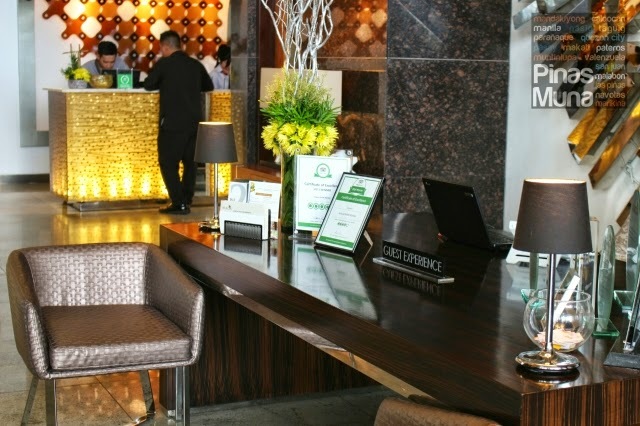 Enderun Colleges, managing partner of Acacia Hotel Manila, developed the Guest Experience management concept specifically for the hotel which focuses on the delivery of excellent service delivery and customer satisfaction. 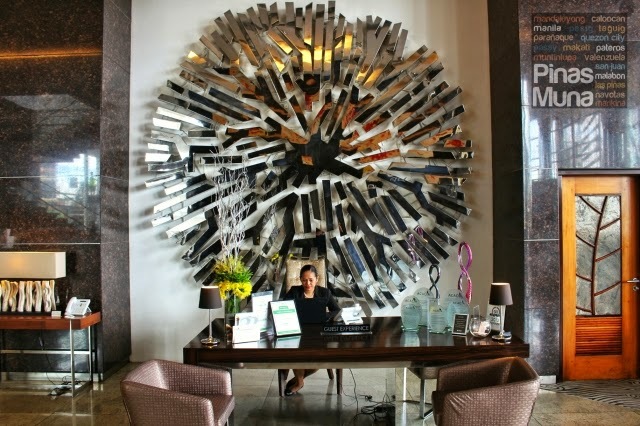 When we arrived at the hotel, we were warmly welcomed by Acacia Hotel's Guest Experience Officers at the elevator lobby. We were asked if we were checking-in and were immediately assisted to the hotel's reception. Checking-in at Acacia Hotel was swift. Shortly after filling-out the registration form and presenting a valid ID, we were told that our room was ready. The receptionist wished us a pleasant stay as we leave the area. Without having to request for an additional electronic key card, we were pleased that the receptionist issued two cards to us. The electronic key card in an important security feature of the hotel. The key card allows the bearer to use the elevator and access the floors where the rooms are located. Without the electronic key card, you can only access floors open to the public such as the restaurants, the gym and the swimming pool areas. Just like an ordinary key, the electronic key card only gives the bearer access to the room to which the key card is assigned. A Guest Experience Officer assisted us from the lobby to our assigned room. We stayed in a Junior Suite during our weekend stay at the hotel. When we opened the door, we were delighted that the lights and the air conditioning were already on. 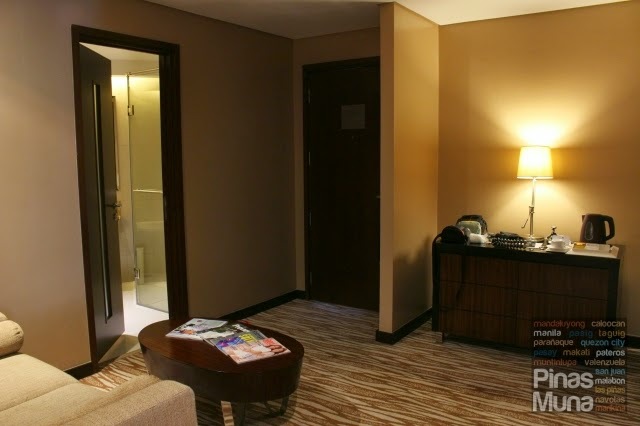 Junior Suites are strategically located corner suites with a floor area of 43sqm. We were welcomed by a very spacious foyer with a sofa and a coffee table. Warm lights and earth colors create a cozy ambiance at the foyer. The area is also well air-conditioned. 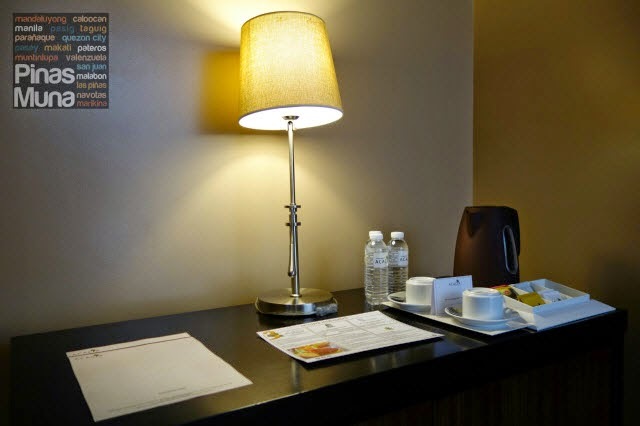 There's also a sofa table at the foyer on top of which are some complimentary items such as two bottles of mineral water, tea and coffee. Beneath is a mini fridge bar containing some treats such as canned juices and soda and chocolates. The drawer also has chips and other snacks. Next to the sofa table is the en suite closet. Inside are an iron and an iron board, a flashlight, and an electronic safe. 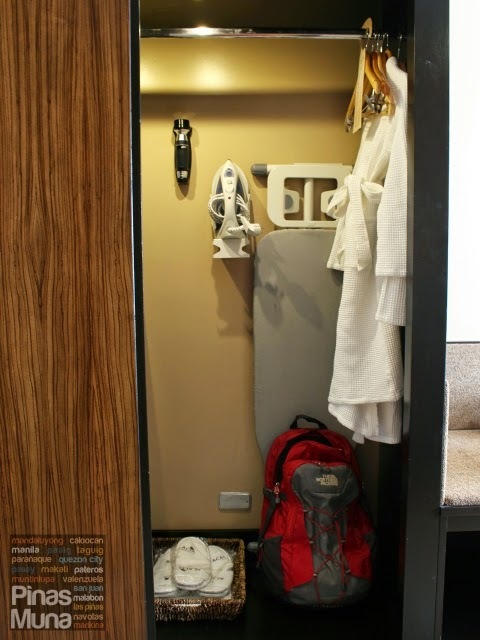 The closet is big enough to fit a huge luggage and space to hang clothes. Acacia Hotel also provides bathrobes and disposable bedroom slippers. Attached to the foyer is the en suite bathroom. The foyer is an appropriate area inside the suite where you can receive visitors, since the bedroom is considered a more private area for the checked-in guests. A wall separates the foyer to the main bedroom, blocking a direct view to the bed thus giving added privacy. When we entered the main bedroom, we notice this sweet note on the cafe table. 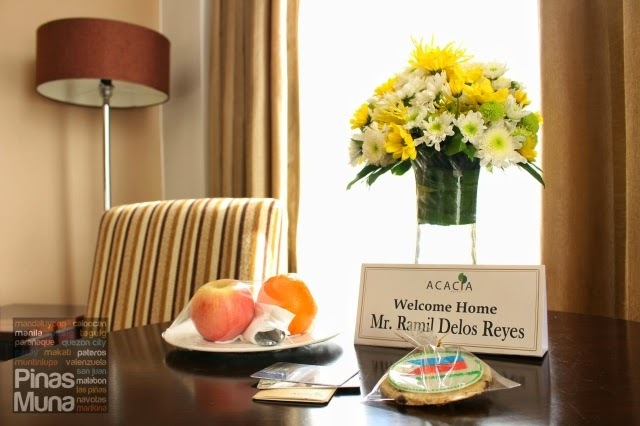 "Welcome Home" it says, and being at home is really how we felt during our stay at Acacia Hotel Manila. As a welcome treat, there's also a plate of fruits served on the table with a matching vase of fresh flowers. How sweet. 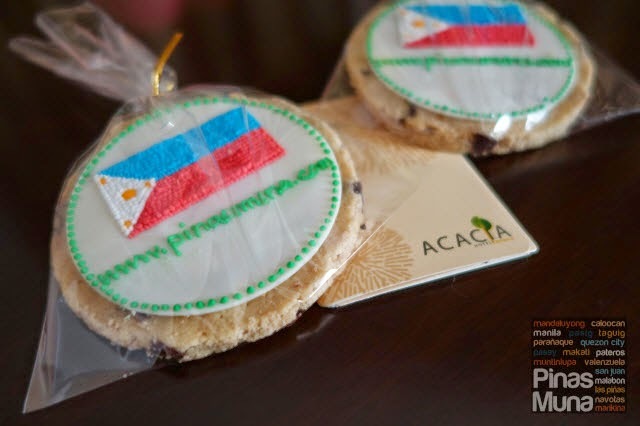 We also noticed these two custom-made pinasmuna.com cookies designed with a Philippine flag. Now, that's really personalized service. We were really impressed by the hospitality here at Acacia Hotel. Is it special treatment? We don't think so. If you search the net for other reviews of Acacia Hotel, the cookies that we got are quite modest compared to some free stuffed toys and goodies received by the other guests. 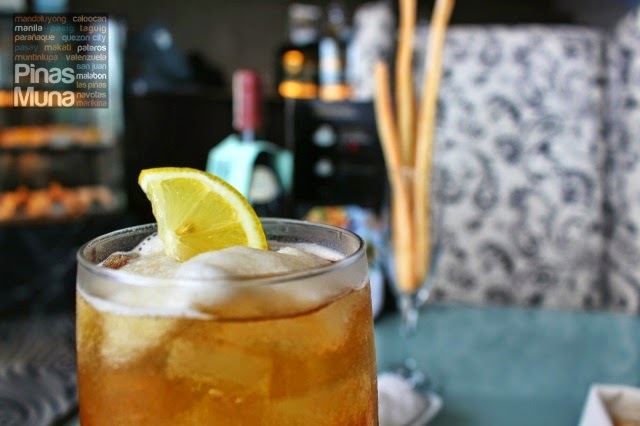 Nonetheless, these small things are what makes every stay at Acacia Hotel a unique experience. Highlight of our suite was the Dream Bed which features a customized orthopedic mattress that guarantees a relaxing and restful sleep. Our Dream Bed also features three pairs of pillows including memory foam pillow-tops and fluffy goose down-feather pillows. Duvet stuffed with goose down-feathers also added extra comfort to our sleep. The linens and pillow cases smelled clean and fresh. 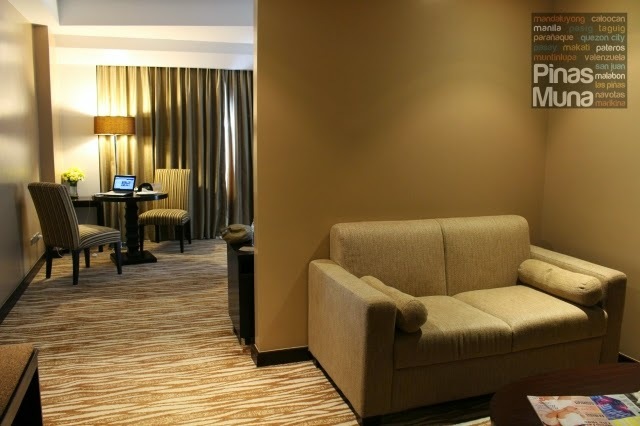 Our suite also featured a full size executive desk, an ideal work space for business travelers. It has a desk lamp with universal socket. 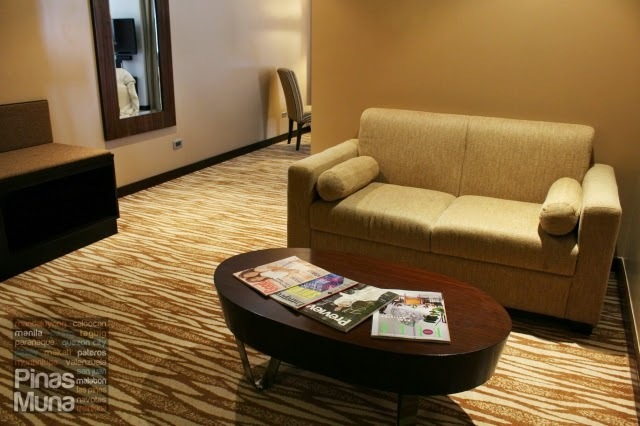 Complimentary Wi-Fi internet access is also available so guests can stay connected during their stay. User name and password shall be issued upon check-in at the hotel, otherwise you can just dial "0" and ask for the log-in details. On the other corner of the suite was a cafe table with two chairs. This is very useful especially for guests who prefer dining in the comfort and privacy of their room. 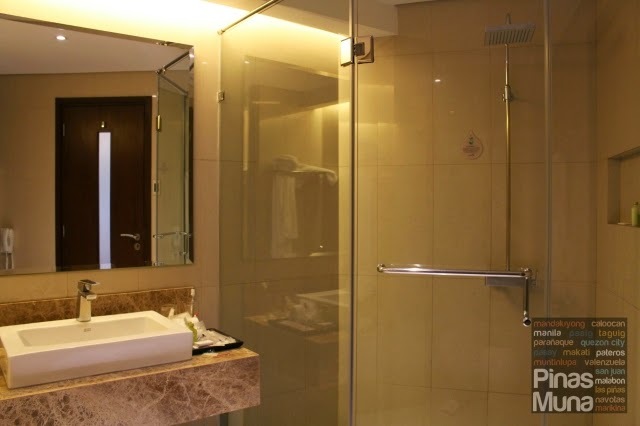 There's also a 40" LCD TV with cable which can keep you entertained or updated with the latest news while inside the room. Watch for the personalized welcome message on the screen when you turn on the TV! Equally spacious was our en suite bathroom. The floors and the walls are covered with marbles. It has a bathtub, a walk-in shower and ample space to move around. A bathtub is a standard feature in all of the room type. Impressive isn't it? Edgar was able to test the bathtub and according to him, it didn't take long to fill the tub because the water pressure was really really good. Edgar did enjoy his moment at the bathtub, something that we don't usually experience in our staycations. What's also great is that the hotel provides more than enough towels that you will need. I particularly love the rosemary-melissa-thyme scent of the shampoo, conditioner and the shower gel. They have a light floral scent that keeps you feeling fragrant all day. The body lotion also has the same scent. It was light and not greasy to the feel. Each bottle has too much content to be consumed in an overnight stay. 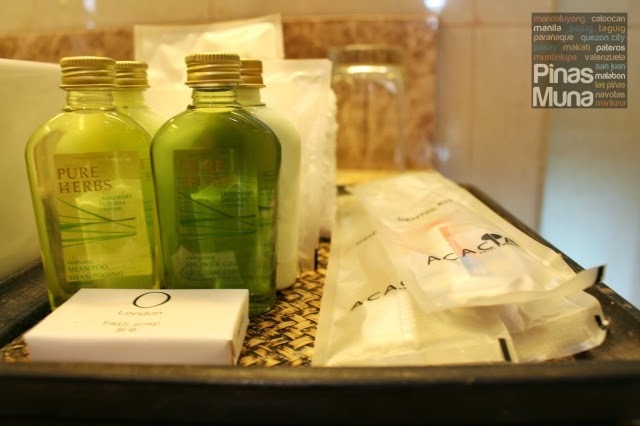 We actually brought home the toiletries and whenever we use them, they keep reminding us of our pleasant stay at Acacia. 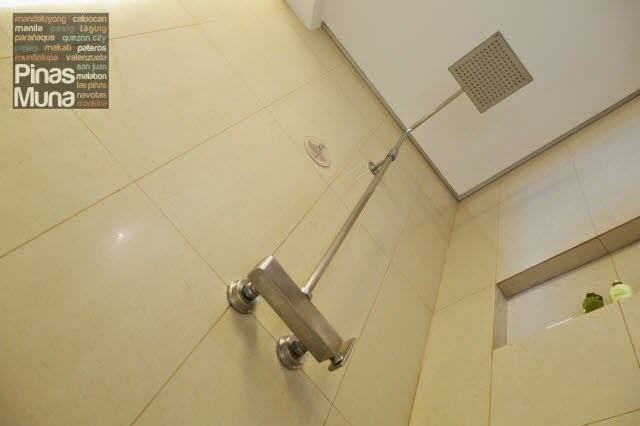 The spacious bathroom also has a walk-in shower. 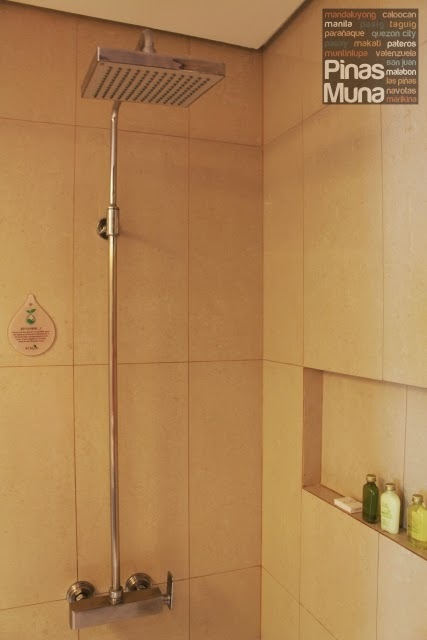 Highlight of the shower was the rain shower head. The hot and cold shower was very easy to control. The water pressure was excellent. 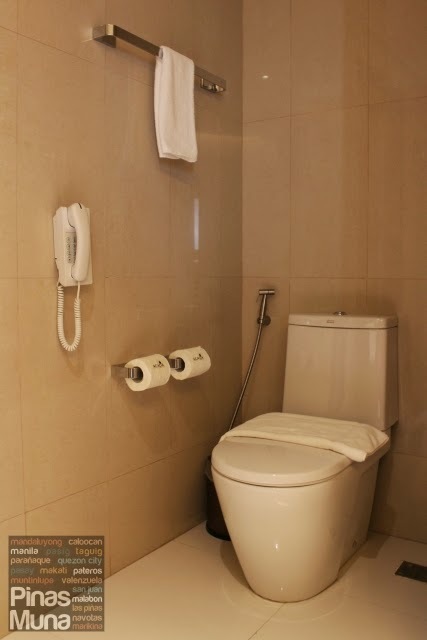 It is also worth mentioning that the toilet is equipped with a bidet. 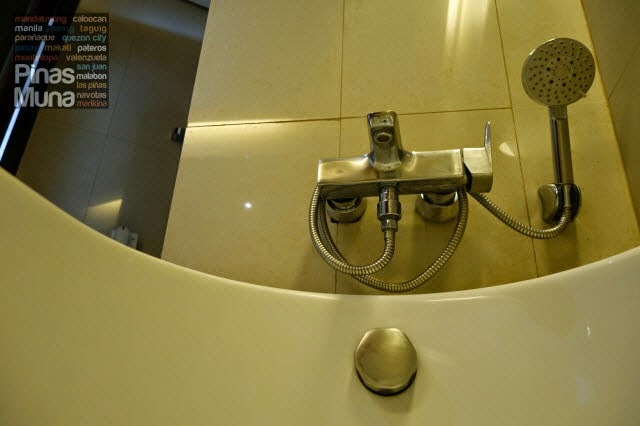 It is needless to say that in Filipino culture, bidet is a must. 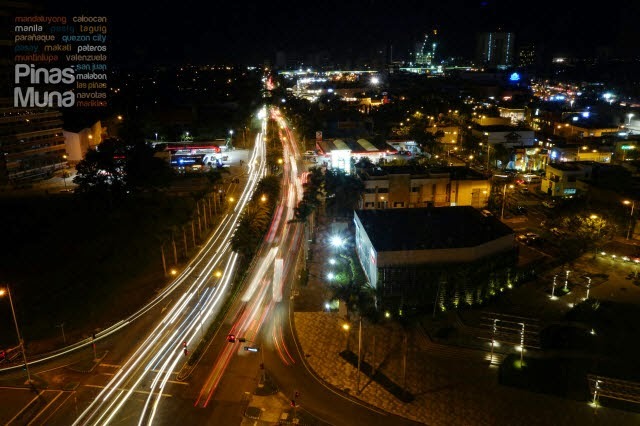 Another highlight of our suite were the picture windows that gave us a stunning view of the Alabang urban landscape. The area is at its most beautiful during sunset. 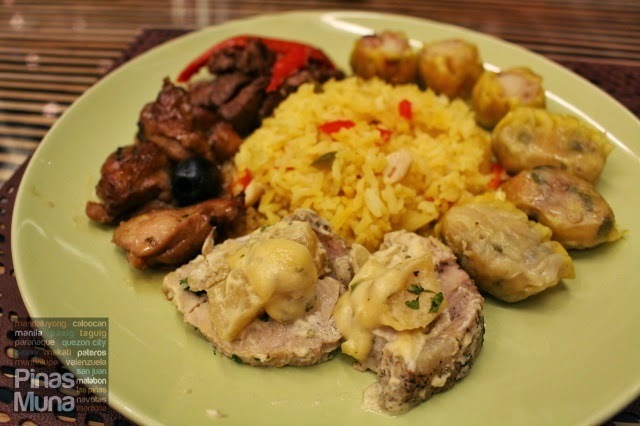 At 7:00pm, we went down to Acaci, the hotel's buffet restaurant, for our scheduled dinner. 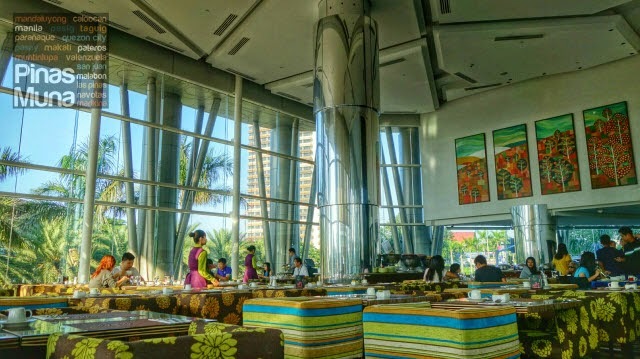 The restaurant's interior features a high ceiling and glass windows, earth toned carpet and and chairs, and warm lighting that creates a cozy ambiance for the diners. 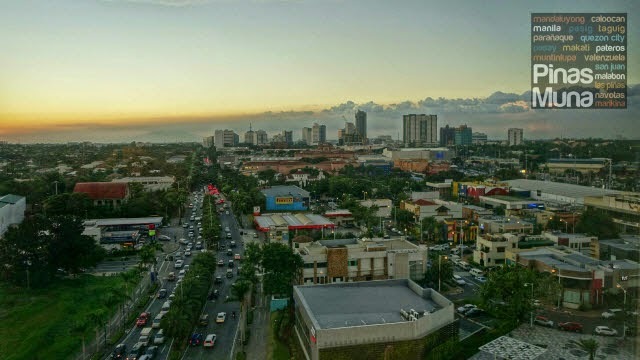 While delighting on a wide variety of international dishes, guests are also entertained with live music with a view of Alabang's busy street scene. 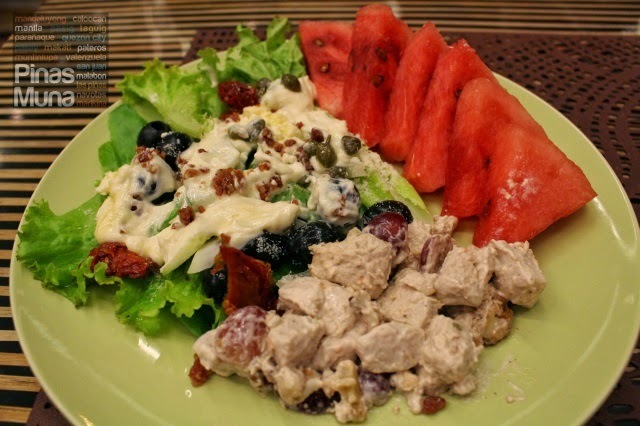 Most notable among the dishes are the salads, the cold cuts, the seafood and the Asian selection of the buffet. Also commendable are the desserts. 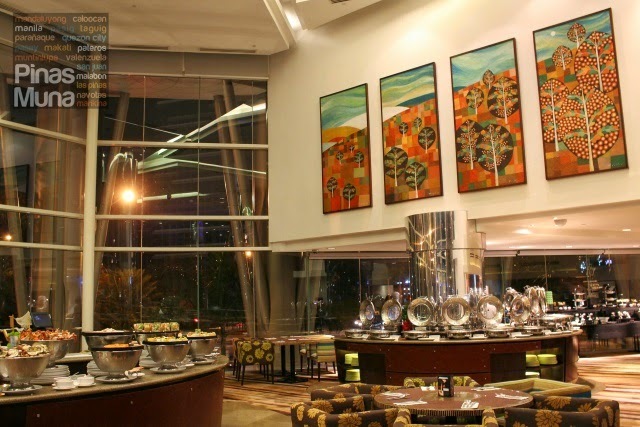 Dinner buffet is available everyday from 6:00pm to 10:00pm. It is best to make prior reservation to ensure availability of table. 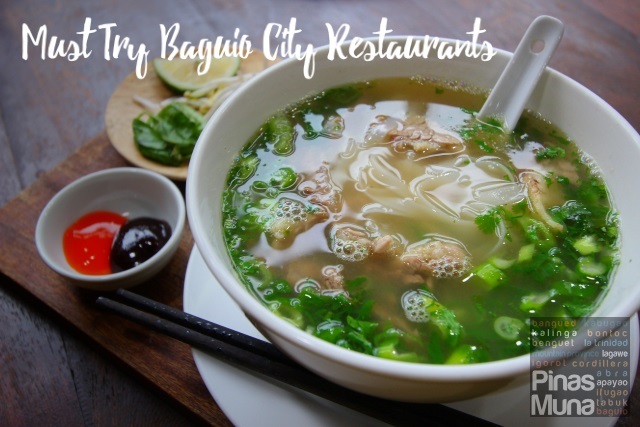 For reservations, you can call (02) 720-2000 local 1911. 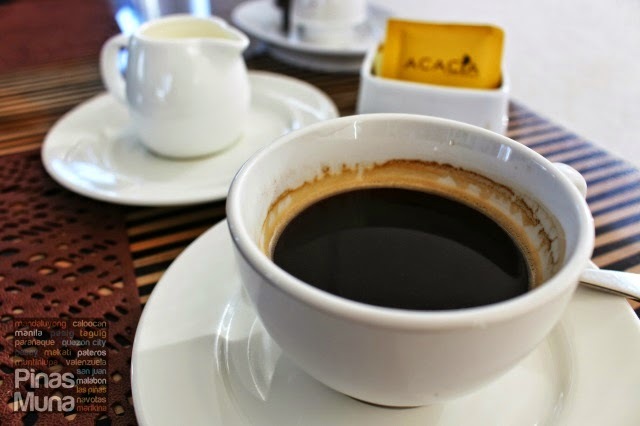 An overnight stay at Acacia Hotel includes complimentary breakfast buffet for two persons. Children below six years old eat for free. In the morning, Acaci transforms into a vibrant dining hall full of color and natural light. It is a perfect setting to wake up one's mind and body with a hot cup of coffee or tea. Acaci's breakfast spread is one of the most impressive we've seen so far in Metro Manila. 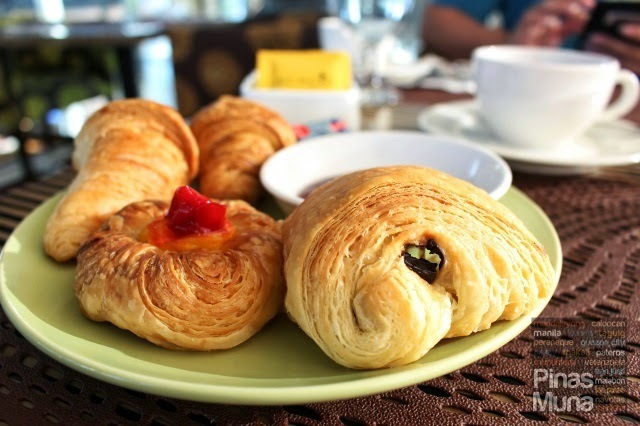 There's a variety of pastries and breads, jams and cheeses. Fresh fruits and greens await the more health conscious guests. 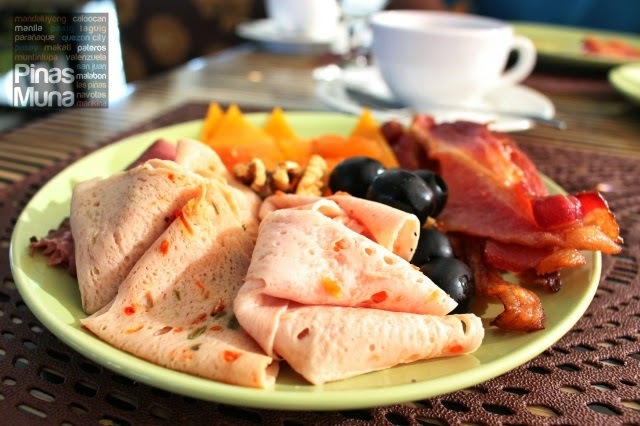 Premium cold cuts, sausages, as well as classic Filipino breakfast favorites are also available. Breakfast buffet is available from 6:00am to 10:00am. 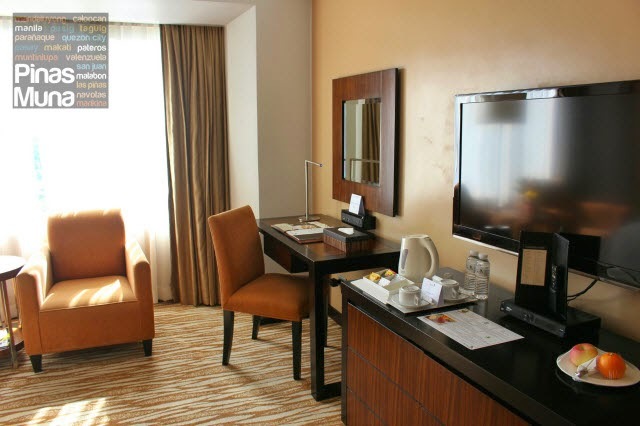 Walk-in guests may also avail the breakfast buffet for P888.00 nett. For reservations, you can call (02) 720-2000 local 1911. 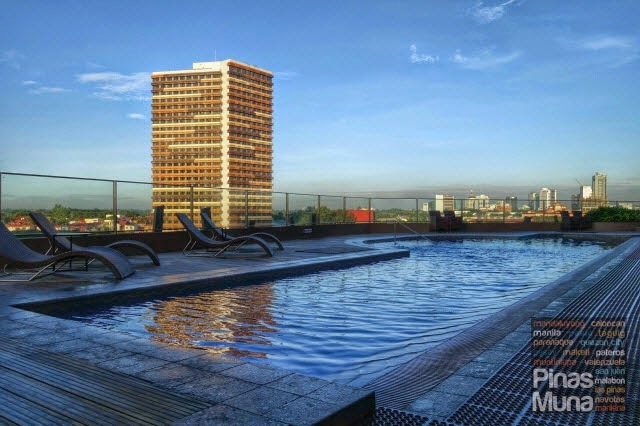 A fun filled weekend staycation at Acacia Hotel is never complete without trying their swimming pool. The perfect time to go swimming is in the morning when there is less people. The view is also at its best during this time. 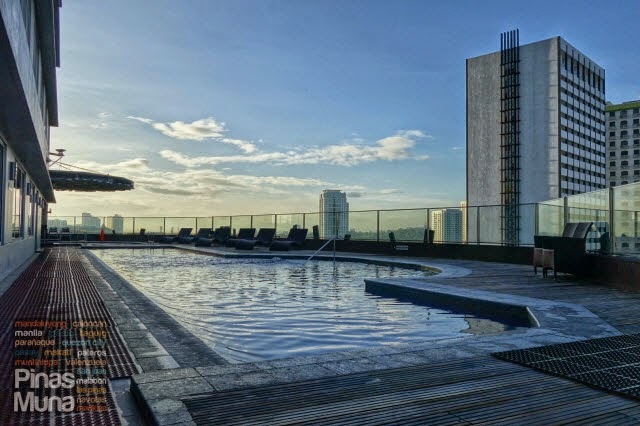 There's a separate pool for adults and children, while a jacuzzi offer a more relaxing dip, bathing in the morning sun with an excellent view of the Alabang skyline. The swimming pool is open from 6:00am to 10:00pm. After our morning swim, it was time to try out the a la carte menu of The Lobby at Acacia. Still full from our breakfast buffet, we ordered Nasi Goreng and Carbonara which Edgar and I shared. The sate which came with the Nasi Goreng was perfectly seasoned. You could taste the flavors into the meat. The sate was also well cooked, with the meat moist and not burnt. The peanut sauce was fantastic! 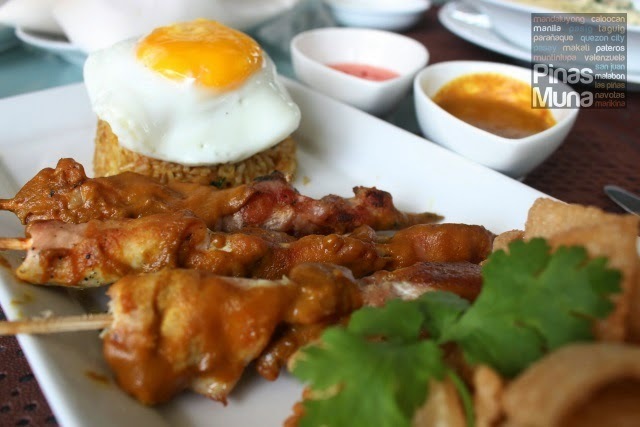 The rice was flavorful and perfectly matches the sate and the peanut sauce. 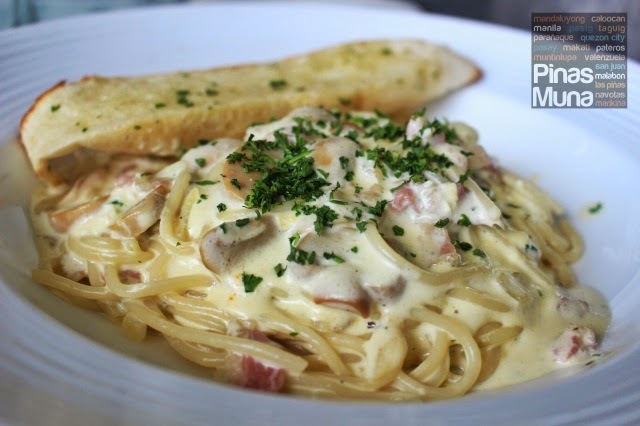 The Carbonara was creamy and well flavored with bacon, ham and mushrooms. The pasta was al dente, just the way we want it. The serving size was just right. The customer service at The Lobby was outstanding. Service was fast and they are very knowledgeable about their menu. They were able to give helpful recommendations on food and they always made sure that we are comfortable by attending to our needs. Before checking-out, we still had time and requested the Guest Experience Officer for a viewing of the hotel's Deluxe Rooms. Although smaller than the Junior Suite, the 34sqm Deluxe Rooms are also equipped with Acacia's standard 5-star luxury facilities and offers an equally relaxing stay to its guests. 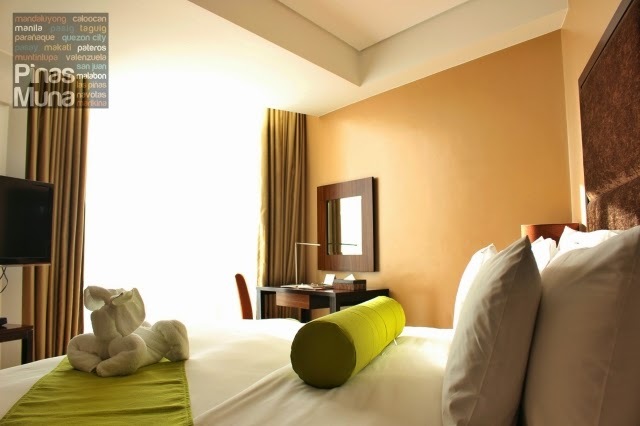 Deluxe Rooms are available in two bed configuration, the Deluxe King and the Deluxe Twin. Both are equipped with a Dream Bed, memory foam pillow-tops and fluffy goose down-feather pillows, as well as duvet stuffed with goose down-feathers. Both also have a coffee table with matching two arm chairs and an overhead sofa floor lamp. There's also a full-size executive desk at one corner of the room. 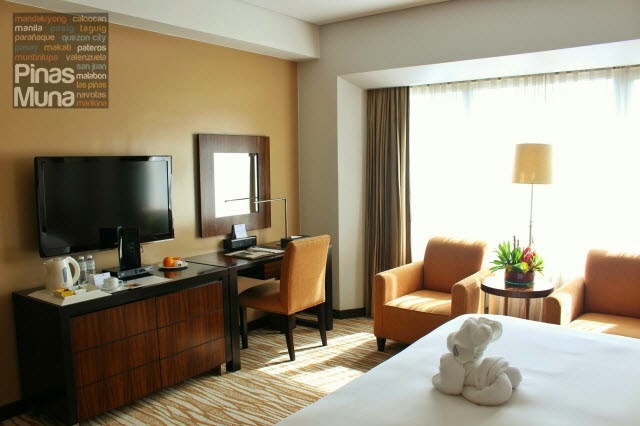 Deluxe Rooms also have a 40" LCD TV with cable, a minibar, coffee and tea maker. 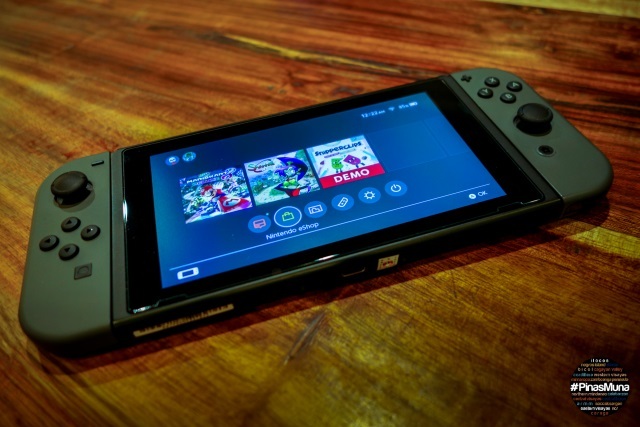 Guests also enjoy complimentary internet Wi-Fi connection. 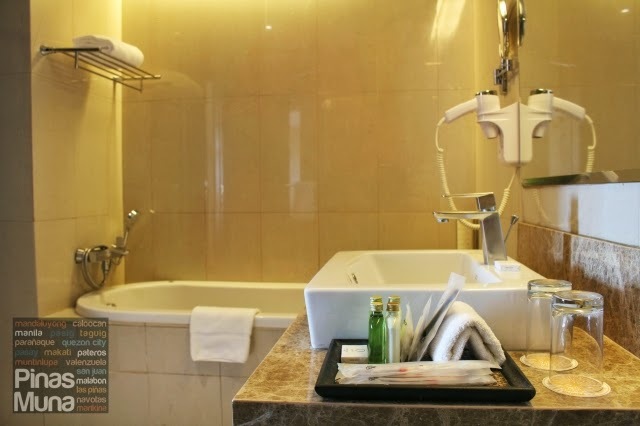 All Deluxe Rooms have a private bathroom with a walk-in shower and a bathtub! 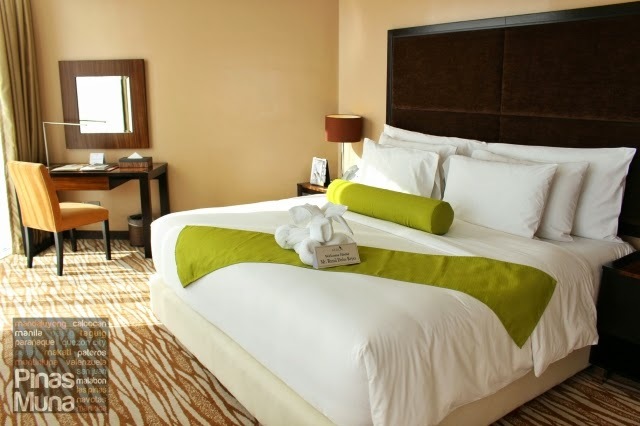 Overall, our Acacia Hotel staycation experience sets our standard for quality and luxury hotel stay to a higher level. 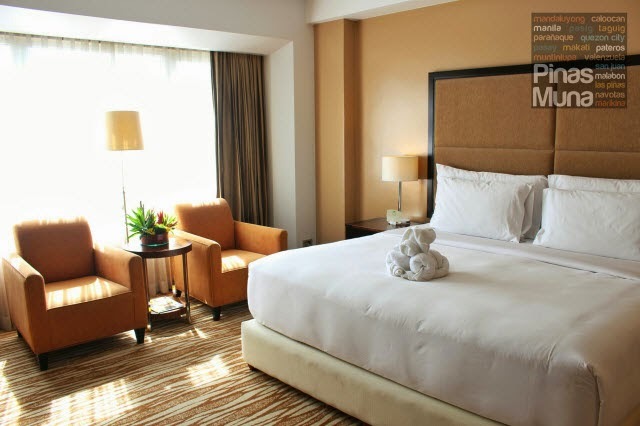 The hotel's well appointed guest rooms and suites with elegant yet modern design and equipped with five-star amenities makes Acacia Hotel a leading luxury hotel in southern Metro Manila. 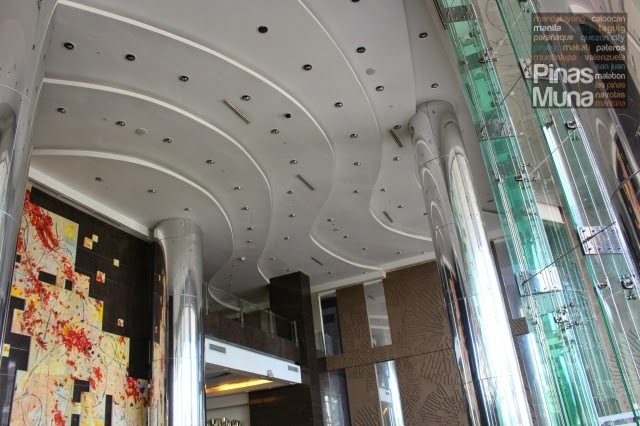 Complementing the top notch facilities of the hotel are its delectable culinary offerings. 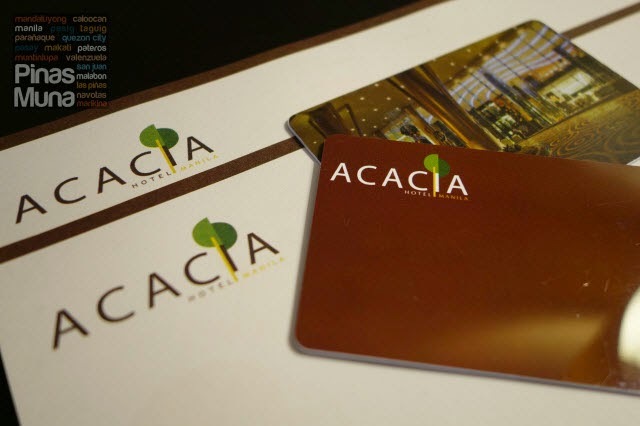 Completing the whole experience is the signature Acacia hospitality delivered by its world-class employees. 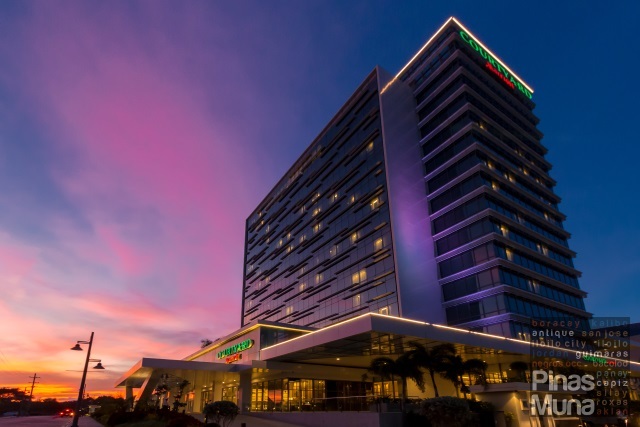 Acacia Hotel Manila will always be our home in the South.